Margaret here. Coming back slowly from a 2 week hiatus--my classes started and I've been having construction going on in my house--with no access to the art room. I was so excited to get in there today but had one unfortunate surprise: DUST EVERYWHERE. Dust on every stamp, every ink pad, every marker...WHOA. I was overwhelmed to say the least. All this and the area was taped off. So I'll be working on getting that place cleaned up while I get myself back into stamping. I thought I'd take it easy easing my way back in...usually if I haven't created anything in a while, I spill the embossing powder, put paper together crookedly, cut wrong...you know Murphy's Law of Stamping! LOL. Wasn't too bad today though. 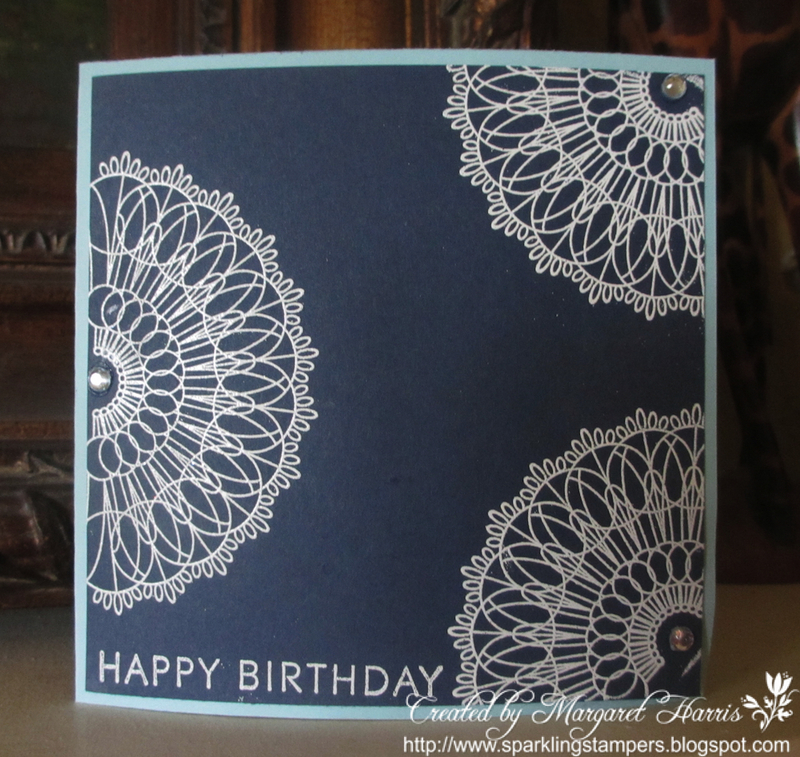 I was inspired by Challenge #40 Double for CAS Colours and Sketches Blog. It is a double challenge: a sketch and colors of dark blue (Night of Navy), light blue (Marina Mist) and white (Whisper White). 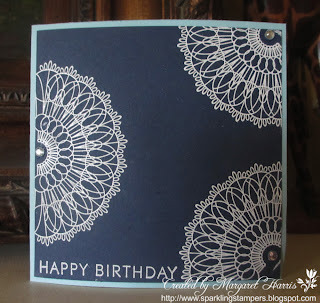 Gave me another chance to use more mandalas. :) This card is for my brother in law and it is belated...it is always so hard to create for a man! But I think between the colors and the pattern, it works really well. Awesome card! Great use of the colors & sketch. Love the stamp images! Thanks for playing along with us at CAS Colors & Sketches! The embossed mandelas are so pretty! Thanks for sharing your card with us at CC&S.